Gas phase molecular spectroscopy is a powerful tool for obtaining information on the geometry and internal structure of isolated molecules as well as on the interactions that they undergo. It enables the study of fundamental parameters and processes and is also used for the sounding of gas media through optical techniques. It has been facing always renewed challenges, due to the considerable improvement of experimental techniques and the increasing demand for accuracy and scope of remote sensing applications. In practice, the radiating molecule is usually not isolated but diluted in a mixture at significant total pressure. The collisions among the molecules composing the gas can have a large influence on the spectral shape, affecting all wavelength regions through various mechanisms. These must be taken into account for the correct analysis and prediction of the resulting spectra. 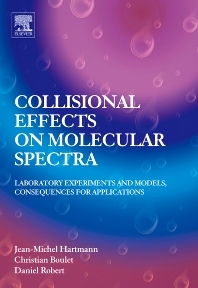 This book reviews our current experimental and theoretical knowledge and the practical consequences of collisional effects on molecular spectral shapes in neutral gases. General expressions are first given. They are formal of difficult use for practical calculations often but enable discussion of the approximations leading to simplified situations. The first case examined is that of isolated transitions, with the usual pressure broadening and shifting but also refined effects due to speed dependence and collision-induced velocity changes. Collisional line-mixing, which invalidates the notion of isolated transitions and has spectral consequences when lines are closely spaced, is then discussed within the impact approximation. Regions where the contributions of many distant lines overlap, such as troughs between transitions and band wings, are considered next. For a description of these far wings the finite duration of collisions and concomitant breakdown of the impact approximation must be taken into account. Finally, for long paths or elevated pressures, the dipole or polarizability induced by intermolecular interactions can make significant contributions. Specific models for the description of these collision induced absorption and light scattering processes are presented. The above mentioned topics are reviewed and discussed from a threefold point of view: the various models, the available data, and the consequences for applications including heat transfer, remote sensing and optical sounding. The extensive bibliography and discussion of some remaining problems complete the text. Jean-Michel HARTMANN: born in 1961, « Directeur de Recherche » for the French CNRS (Centre National de la Recherche Scientifique has been carrying research and advising PhD students in the field of the book for about twenty years. He is the director of the French Molecular Spectroscopy Network and the author of more than 100 publications in international journals. Christian BOULET: born in 1947, Professor at Université Paris XI (Orsay) has been carrying theoretical researches in the field for more than 30 years and is the author of about 130 publications in international journals. He has been the director of the Laboratoire d’Infrarouge and of the Laboratoire de Physique Moléculaire et Applications.